I recently installed a Canary All-in-One Home Security Camera System. Excellent video with some nice security features. You can read our full review here. Installation was easy however I had immediate issues with the Canary temperature, humidity and air quality monitoring to work properly. This article will help you to get the Canary temperature and other environmental monitors to function properly. There were two issues that I ran into regarding the Canary temperature. The first was getting an accurate reading of the temperature and that was simple to fix. The second issue was that the Canary temperature, humidity and air quality readings had significant time gaps reporting back to one of my phones. That’s right – the problem only happened with one of my phones, not both. So when my wife checking it out on her Apple iPhone 5s Canary app, it was up to date, perhaps a few minutes behind at most. However, my brand new Apple iPhone 6s Plus had a gap that would potentially span over two hours. A photo of that issue is what’s attached to this article. So let’s talk about how to get the Canary temperature monitor to work properly. The first issue was easier to fix. Although my thermostat on the other side of the room was reading a constant 71 degrees, the Canary temperature was saying it was 75. That’s a fairly large difference. So I looked around the room to understand what could be doing that. There was a lamp located about 1-2 feet away. I turned off the lamp, waited a few hours, the Canary said 72 degrees. That was close enough for me to say that the lamp was causing a rise in the Canary temperature reading. So you would think I moved the lamp? Nope. Replaced the bulb with a CFL which runs much cooler. That problem was solved. The next issue wasn’t as easy to fix. The photo that accompanies this article shows exactly what the problem is about. 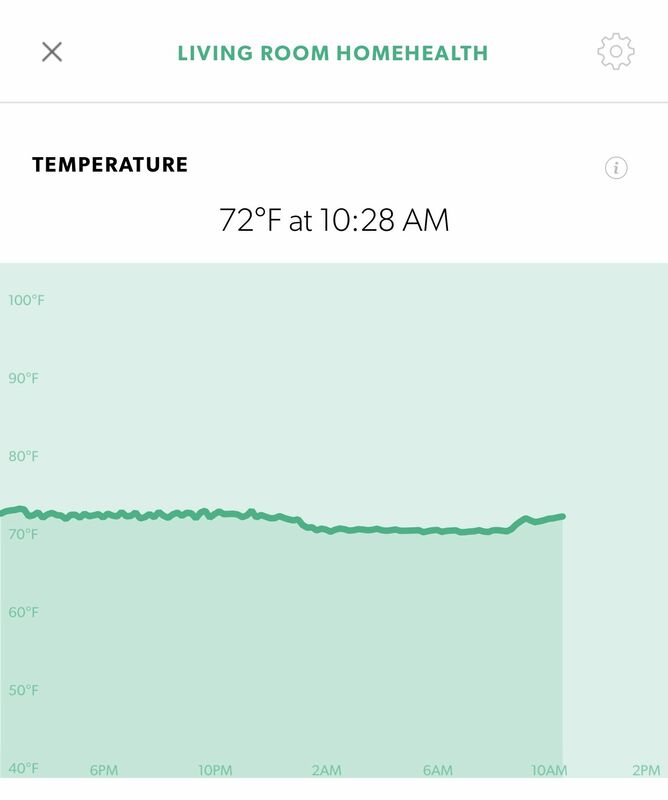 The Canary temperature says it’s 72 degrees at 10:28 AM. Problem is it’s 2:10 PM. I’m missing close to four hours worth of temperature. I need this to be up to date in case there’s a breakdown on my air conditioning or heat while I am away. A five or ten minute gap is ok. Not a four hour gap. Here’s the funny thing – if I get back into the app in ten minutes, it might be up to date. It was a 50/50 chance on it being current. So this turned into an opportunity to try Canary customer support. I have run into a mixed bag or results with various customer service departments with home security cameras so I wasn’t looking forward to this. The Canary Customer Support Page is a little hard to find so I provided a hyperlink if you need it. I opted for email and I was surprised to get a response on a Friday night. I’ll review all of the dialogue which you should try before contacting Canary because one of these steps might solve the issue for you. The initial response came back a few hours later. I was instructed to unplug the Canary to reset the sensor. They said if both of my phones had the issue, this would likely solve it. Since it was just one of my phones, I didn’t try that step and replied back to them that it was a single phone. That didn’t fix it but it’s a good exercise to go thru as it’s been known to fix similar issues. Back to Canary I went. They asked me to logon with my other email ID but use the same phone that had the problem. I thought that fixed it then the next day the issue was back again. I thought about what may have changed and realized that I turned on fingerprint recognition. I turned that feature off. That fixed the Canary temperature reporting gap. I’ll admit I wasn’t too confident this was going to work, but it did. It makes no sense to me as to how that would affect a background process but it fixed it. Excellent customer service from Canary. Now I can get a full 24 hours worth of environmental readings without a significant delay. Hopefully, if you’re having a similar issue, one of these steps fixes your issue.